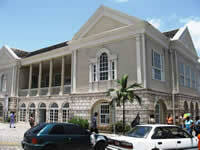 Built in or around 1774 this building has proven to be quite an important monument in St. James' history. Now owned by the St. James Parish Council, the Old Court House in Montego Bay is probably best known for the trial of National Hero Samuel Sharpe which was held in 1832. Sharpe led the Great Slave Rebellion of Christmas 1831. Many estates, including the surrounding areas of the Parish were burnt. Sharpe and many others who had been involved in the rebellion were tried and hanged. It is argued by many historians that although the rebellion did not result in freedom for the slaves, it accelerated the abolition of slavery 1834.